Most Bloodaxe titles are demy-octavo [D8vo] in size (216 x 138mm) or royal [R8vo] (234 x 156mm); some use the smaller large crown octavo format [LC8vo] (198 x 129mm). The books are produced with 16-page or 32-page signatures, and this factor will be a determining factor in arriving at the final extent of a book. Bloodaxe’s “house” typeface is Ehrhardt. The usual typesize for D8vo body text is 10.5/13 or 10.5/14 (i.e. 10.5 point type on 13 or 14 point leading) with a column width of 24 ems (101mm). The royal size is used for particular kinds of books, such as those in which the poems have many longer lines; here the point size may be 10.5 or 11pt with proportionally wider leading. Many older Bloodaxe titles were set 10.5/12 which gave more lines per page, but that setting is no longer used. Our books are printed by Bell & Bain in Glasgow. Most are printed on 100gsm paper (although 90gsm paper is often used for large anthologies). The papers we choose are white, high quality and acid-free (ph7 – which is neutral, with an alkaline buffer i.e. acid-free leaning towards alkaline). This kind of paper will not discolour, rip or break up after ten years, as happens to the kinds of paper used by many other publishers. Most publishers use a thinner paper than this, but we have always printed collections on 100gsm paper as a matter of policy: this means there is much less “show-through” of type from the recto side or from the next page (the 100gsm paper has 93% opacity, which compares with 90% for 80gsm paper), so that the only signiﬁcant “show-through” occurs where large solids are present, e.g. on the title-page. Our white paper is ecologically superior and higher in quality than the cream paper used by some other publishers which has dye added to the paper pulp to make the paper look like traditional kinds of cream paper. Because Bloodaxe publishes around 30 new titles as well as several reprints a year, we are able to benefit from batching and bulk purchase pricing, which means we get higher quality paper for a lower price than would be possible with one-off production methods. 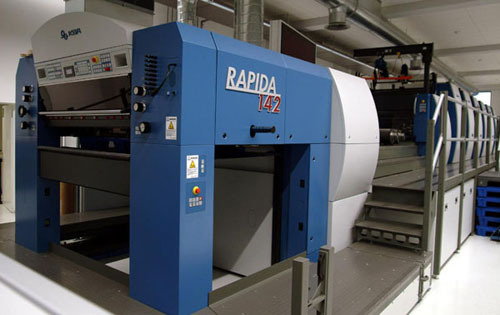 Bloodaxe titles are printed on a four-colour KBA Rapida 142 sheet-fed press used at Bell & Bain in Glasgow, one of the first of a new range of German-built hi-tech presses to be installed in Britain. This photo shows a six-colour press from the same series. Bell & Bain (and any other printers we may use) source their paper from mills with FSC & PEFC chain of custody certification – an assurance that wood comes from a certified, properly managed forest. The Forest Stewardship Council (FSC) is an international, non-governmental organisation dedicated to promoting responsible management of the world’s forests. It was founded in 1993 in response to public concern over deforestation, and demand for a scheme of trustworthy labelling of products to enable consumers to be aware of materials that have been derived from sustainable sources. The scheme goes further than good management of timber, and also considers the impact of forestry on the environment. This includes the people who live in and benefit from the woods; the water courses that flow through forested areas; and the wildlife affected. It also considers the types of timber replanted and whether they are appropriate for the area. Most of our books are printed on two kinds of paper. One is a James McNaughton paper called Festival Offset produced at Stora Enso’s Nymolla mill in southern Sweden. Stora Enso is the world’s largest producer of paper and board products. Nymolla paper stock benefits from a high opacity due to the precipitated calcium carbonate used as a filler and a good bulk, a benefit of Nymolla’s own pulp produced on site. The mill is of course EMAS and ISO 14001 and committed to achieving continuous improvement through environmental management systems. Festival Offset is aged resistant to ISO 9706 standard, and achieves its whiteness using a totally chlorine free process. The papermill is 85% self-sufficient in terms of power production, and waste water from pulp production supplements the hot water circulation system for the nearby communities. All packaging materials are recyclable. Forests, plantations and land owned by Stora Enso in Sweden. The second paper is Print Speed, a product supplied to the printer by the Soporcel paper mill in Portugal, which also has excellent environmental credentials. The paper is produced chlorine gas free. All the power used by the pulpmill and over 50% of that used by the paper machine is produced by the mill’s waste material, and all local and European legislation is satisfied, with gaseous emissions being 45% under permitted levels. 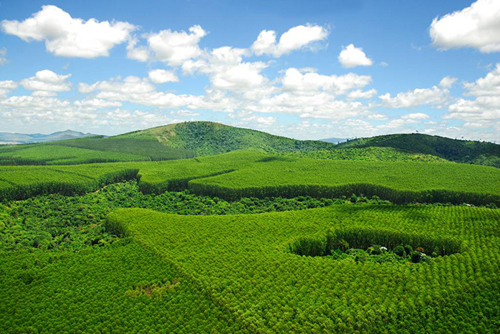 The paper mill is involved in a programme of properly managed eucalyptus forestry, involving careful replanting. Regulations in Portugal demand an environmental impact study before new eucalyptus plantations are begun. Soporcel has 50,000 hectares of eucalyptus and a further 20,000 hectares producing wine, olive, honey and cork, and has its own flock of 10,000 sheep. The covers use 240gsm Trucard board, coated on one side and laminated afterwards. For binding we choose a pliable glue called Instant-Flex 718 which allows the book to be splayed open without the spine being broken. Unlike the glue used by mass market publishers, Instant-Flex 718 is not brittle, and will not crack after a small amount of handling, and because the binding is sewn as well as glued, the pages will not drop out. It is also a chemically-based glue not derived from any animal product, and only contains waxes and polymers. As with choice of paper, we have been concerned to maintain both durability and quality in making our production decisions about the kind of binding we use. Bloodaxe, Cape and Faber sew most of their poetry books; Carcanet, Chatto and Picador’s paperbacks are “perfect bound” (i.e. the signature folds aren’t sewn but shorn when the book blocks are bound), and Picador also use inferior glue, so the spines of their unsewn paperbacks will split and the pages drop out with minimal use. Book block with sewn signatures prior to application of glue in the binding process. Bloodaxe also publishes a small number of books in hardback and paperback. This has to be a marketing-led decision: we can only publish books in hardback where there is a collectors’ readership or sometimes a library market for a particular book. The hardback binding is also high quality, and production decisions take into account that these editions have a collectors’ readership, so that the binding incorporates head and tailbands (Swithin wove art silk), coloured endpapers (120gsm) and high quality 125gsm Wibalin non-woven cover material for the hardback “cloth” (made from special ECF pulps for high strength and durability, with a special impregnation to give good scuff resistance). These materials conform with European Toy Regulations EN71 for dyes. The decisions we make in all the above areas of production are aimed at achieving several things. 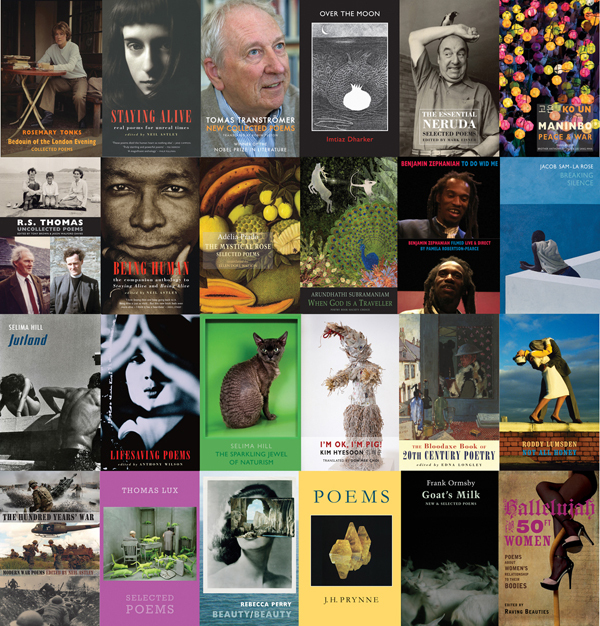 Our printing volume enables us to achieve higher production quality at a lower cost than that paid by many poetry publishers. This benefits all our authors, and also enables us to hold our cover prices (currently £9.95 for a 64-page paperback). Each collection is produced as an individual title with its own distinctive cover image and typography, but the production elements are common to all Bloodaxe collections: clear, readable type inside the book and on the cover, as well as durable reader-friendly binding, high quality white paper, and a laminated cover which is resistant to wear and tear. These production elements are part of Bloodaxe’s “identity”: modern in look and appeal but traditional in our insistence on production quality and durability.